Does President Barack Obama have a strategy towards the Islamic State? This question will be answered today at 9:00 p.m. ET as Barack Obama, who now has developed a strategy (so he claims), addresses the U.S. nation in a prime time event. According to a Washington Post-ABC News poll, Americans view the Islamic State a major threat for the United States and its interests and so have widely supported airstrikes on Iraq. It is unclear whether there will also be air strikes against the main hub of the terrorist ‘state’ in Raqqah Syria. USA Today is reporting that Obama’s pitch will include asking congress to approve paying money for training ‘moderate’ Syrian rebels to fend off the ISIS. According to another Washington Post-ABC News poll, President Obama’s ratings have declined to a new low as American’s feel that Obama has failed as a president. 38% (down 8% since July) of the Americans approve of the international affairs being handled by Obama, 52% believe he has been too cautious in dealing with the Islamic insurgents and 65% are in favor of extending the U.S. air strikes to Syria. What a difference a year makes! Around 12 months ago John Kerry was begging the American people to support a strike on Syrian dictator, Bashar Al-Assad. Now Obama will be making a pitch to strike ISIS (or ISIL or IS), which is an enemy of the regmine. It should be noted that although there is much evidence that Assad has strengthened ISIS to discredit the opposition, that move is clearly tactical as Assad shares nothing in common with ISIS nor does he plan to share power. However, unlike one year ago, when the US population broadly opposed any strikes on Syria, today, the American people are far more supportive of a strike against the terrorists in Iraq and Syria. In his speech, Obama will reportedly be discussing the progress made in Iraq to fight the militant insurgents, and the formation of a national government in Baghdad. Obama will also be talking about leading an international alliance to destroy the ISI, but will need help of those near in the region to help in the ground battle. Earlier this week, the U.S. fighter jets conducted bombing raids on Haditha Dam in Anbar province, but there is no talk of ground troops. According to The Guardian, a senior administration official issued a statement to the media in which he said, “Tonight you will hear from the president how the United States will pursue a comprehensive strategy to degrade and ultimately destroy ISIL, including US military action and support for the forces combating ISIL on the ground – both the opposition in Syria and a new, inclusive Iraqi government.” John Kerry today, has stopped in Baghdad, ahead of the speech to meet with Iraq’s newly appointed Prime Minister Haider al-Abadi. The U.S. intervention in the Middle East, as pledged by Obama when running for president, was supposed to have ended three years ago. Now, as he announces further intervention in the region, it appears to be more aggressive. What questions will the U.S. citizens have then Obama address the nation? According to CNN, as Obama addresses the nation some key questions citizens might ask themselves are: how does the President define the nature of the enemy? Is it geographic or ideological? Can Obama bring himself to describe the religious intensity of our enemies? What would the President consider victory? What are our strategies to defeat terrorists coming to the United States? Will Obama surprise everyone with his strategy to tackle the current situation in the Middle-East? Stay tuned as we provide live coverage of Obama’s speech below. Tonight at 9 p.m. ET, President Obama will address the nation on the United States’ strategy to degrade and destroy ISIL. You can watch the President’s address from the State Floor of the White House live at www.whitehouse.gov/live. September 10, 2013 – Obama Syria Speech Address – President Obama delivered a speech to the American people on Tuesday night on Syria outlining the U.S. response to the Syrian regime’s use of chemical weapons against rebels and civilians. Obama’s speech comes after news that the Syria has agreed to surrender its chemical weapons stockpiles to international control for eventual destruction, which Obama has indicated could avert a U.S. strike. It seems that many Americans would even be willing to support boots on the grounds. 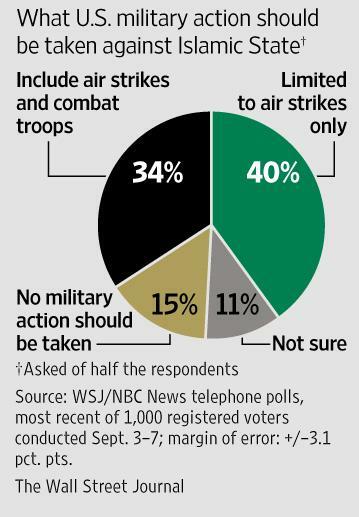 Check out this WSJ graphic which shows that 34% of Americans favor using combat troops and air strikes in the fight against ISIS. President Obama is to begin speaking now – unless he is delayed. Viewers can watch the piece live above – we will have notes on the speech, analysis and more ‘down here’. 9:05PM Obama unveils the strategy right on time. Obama begins the speech saying we have taken out Osama Bin Laden, have taken out terror leaders in Yemen, Pakistan and elsewhere. Obama says America is safer, but we still continue to face terrorists around the world, and this is the case even today. Today, the greatest threats come from the ME and North Africa, especially ISIL. Obama says ISIL is not Muslim and it is not a state either. ISIL is pure and simple a terror organization, says Obama. Obama says that ISIL is unique in its terrorism and barbarism. 9:10 Obama says that US airstrikes in Iraq have saved thousands of lives, but we cannot take the place of Iraq or their neighbors. Obama notes that Iraq has formed an ‘inclusive’ Government, now that Iraq has done so, Obama says we will conduct airstrikes working with the Iraqi Government to hit ISIL targets while Iraqi Government forces use down forces. Obama says that we will also attack targets in Syria if they threaten Americans. Obama says that an additional 475 forces (non combat) will be sent to Iraq to help Iraqi forces and Kurdish forces. In Syria, Obama calls on Congress to equip the ‘moderate’ rebels, because we can ‘never rely on the Assad regime’. 9:15: It will take time to eradicate a cancer like ISIL and Obama says there are risks. Obama is stating there will be no combat troops on foreign soil, rather it will be done through partners and using partners on the front lines. Obama says this approach has been successful in both Somalia and Yemen. Obama notes September 11th is tomorrow and soon is the six year anniversary of the collapse of Lehman Brothers. Obama says that the US economy is thriving and we have more going for us than any other country in the world. Obama says this makes him more confident in America’s future, and it is America which has rallied the people against Russian aggression, it is our doctors who can cure Ebola, and it is America helping Muslims not only against terrorism but around the world. But Obama says we also welcome our responsibility to lead and stand for justice and dignity. Obama says I ask for your support in carrying this mission forward. Obama talks about the saving of Yazidis saved by the US and how thankful they were for saving their lives. 9:18- The speech is now over and was shorter than many anticipated – stay tuned for post analysis and hopefully the transcript. Many questions remain such as why the US will seemingly work with Iran but not work with Assad to help fight IS. The Islamic State of Iraq and the Levant (ISIL) poses a clear threat to the people of Iraq and Syria, and to the broader Middle East, as well as U.S. persons, allies and interests in the region. Left unchecked, ISIL could pose a growing threat beyond the region, including to the U.S. homeland. The United States is meeting this threat with strength and resolve. In recent weeks, we have increased intelligence resources devoted to the threat and sent U.S. personnel to assess the situation on the ground. We have responded with immediate action to protect Americans in Iraq and to prevent large-scale humanitarian catastrophes, including by conducting over 150 successful airstrikes in Iraq. These strikes have kept our personnel and facilities in Baghdad and Erbil safe, killed ISIL fighters, destroyed ISIL equipment, protected Iraqi critical infrastructure, and broken ISIL sieges against an Iraqi city and civilians trapped on a mountain. Along with dozens of international partners, we have provided material support for Iraqi forces to support their fight against ISIL. Our strikes and resupply efforts have enabled Iraqi forces to take the fight to ISIL on the ground, reclaim key territory, and saved thousands of innocent lives. Our goal is clear: to degrade and ultimately destroy ISIL through a comprehensive and sustained counterterrorism strategy so that it’s no longer a threat to Iraq, the region, the United States, and our partners. To achieve this goal, our strategy will be underpinned by a strong coalition of regional and international partners who are willing to commit resources and will to this long-term endeavor. Dozens of countries are already contributing in Iraq – from military to humanitarian support – and in coming days and weeks we will work to strengthen and expand that coalition. Supporting Effective Governance in Iraq: We have made clear that additional U.S. action depended on Iraq forming an inclusive government, because only a united Iraq — with a government in Baghdad that has support from all of Iraq’s communities — can defeat ISIL. A new Iraqi government was formally sworn in on September 8 and we will support it in efforts to govern inclusively and to take significant, concrete steps to address the legitimate grievances and needs of all Iraqis. Denying ISIL Safe-Haven: The Iraqi Government is taking the fight to ISIL, and will ultimately be the one to defeat it in Iraq. But our Iraqi and regional partners need our support and unique capabilities to blunt ISIL’s advance. The President announced that we will conduct a systematic campaign of airstrikes against these terrorists. Working with the Iraqi government, we will expand our efforts beyond protecting our own people and humanitarian missions so that we’re hitting ISIL targets as Iraqi forces go on offense. The President also made clear that we will hunt down terrorists who threaten our country, wherever they are. The President will not hesitate to take direct military action against ISIL terrorists in Syria and in Iraq. We will degrade ISIL’s leadership, logistical and operational capability, and deny it sanctuary and resources to plan, prepare and execute attacks. Simply put, ISIL will find no safe-haven. Building Partner Capacity: We will build the capability and capacity of our partners in the region to sustain an effective long-term campaign against ISIL. The President announced that he will send an additional 475 U.S. service members to Iraq to support Iraqi and Kurdish forces with training, intelligence and equipment. In addition to providing weapons, ammunition and equipment, U.S. Special Operations Forces (SOF) will train and advise Iraqi forces, including Kurdish forces, improving their ability to plan, lead and conduct operations against ISIL. Further, the new Iraqi government has asked for help forming National Guard units that would be recruited locally and be responsible for protecting their own communities and securing areas freed from ISIL’s control – a step that, along with long overdue political reforms, can drive a wedge between ISIL and Sunnis who have been alienated by their central government. The President is also calling on Congress to provide additional authorities and resources to train and equip Syrian opposition fighters in the Continuing Resolution they are debating this work period, so they can defend themselves and their neighborhoods against ISIL incursions and ultimately push back on ISIL forces and the Assad regime. We will strengthen the opposition as the best counterweight to extremists like ISIL, while pursuing the political solution necessary to solve Syria’s crisis once and for all. The growing and evolving nature of the ISIL threat underscores the importance of the Counterterrorism Partnerships Fund (CTPF). The CTPF request for $5 billion would allow us to train, build capacity, and facilitate support for partner countries on the front lines of countering shared terrorist threats, both in the region and beyond. The CTPF includes $500 million for a Department of Defense program to train and equip the Syrian opposition as described above and $1 billion to build resiliency in the states neighboring Syria to ensure they can continue to counter threats to their internal stability and to support communities that are contending with refugees. Enhancing Intelligence Collection on ISIL: Continuing to gain more fidelity on ISIL’s capabilities, plans, and intentions is central to our strategy to degrade and ultimately destroy the group. Intelligence, Surveillance, and Reconnaissance flights and other important efforts will strengthen our ability to understand this threat, as well as to share vital information with our Iraqi and other regional partners to enable them to effectively counter ISIL. Disrupting ISIL’s Finances: ISIL’s expansion over the past year has given it access to significant and diverse sources of funding. The U.N. Security Council resolution that passed unanimously in August demonstrated the broad international consensus to disrupt ISIL’s finances. We are already working aggressively with our partners on a coordinated approach that includes: reducing ISIL’s revenue from oil and assets it has plundered; limiting ISIL’s ability to extort local populations; stemming ISIL’s gains from kidnapping for ransom; and disrupting the flow of external donations to the group. Our domestic laws also provide additional tools in this effort, enabling us to sanction or prosecute those who fund ISIL’s activities. Exposing ISIL’s True Nature: Clerics around the world have spoken up in recent weeks to highlight ISIL’s hypocrisy, condemning the group’s barbarity and criticizing its self- proclaimed “caliphate.” We will work with our partners throughout the Muslim world to highlight ISIL’s hypocrisy and counter its false claim to be acting in the name of religion. Disrupting the Flow of Foreign Fighters: Foreign terrorist fighters are ISIL’s lifeblood, and a global security threat—with citizens of nearly 80 countries filling its ranks. Over 100 foreign fighters from the United States have traveled or attempted to travel to the conflict. On September 24, the United States will convene an historic Summit-level meeting of the UN Security Council, focused on this issue. Protecting the Homeland: We will continue to use the criminal justice system as a critical tool in our counterterrorism toolbox. Federal criminal laws provide a sound basis to prosecute those who provide material support to ISIL or who conspire with ISIL to plot attacks at home or abroad. With respect to aviation security, we will work with air carriers to implement responsible threat-based security and screening requirements, and provide additional screening to individuals suspected of affiliation with ISIL. Finally, we will counter violent extremism here at home, including tailored domestic programs to prevent violent extremism and radicalization in order to intervene with at-risk individuals before they become radicalized toward violence and decide to travel abroad to Syria and Iraq to join ISIL. Humanitarian Support: We and our partners will continue to provide humanitarian assistance to the displaced and vulnerable in Iraq and Syria. We will also continue to work with host governments to mitigate the humanitarian and economic effects of the conflict in neighboring countries, recognizing that the refugee crisis calls on our common humanity and presents a significant challenge to regional stability. As ISIL seeks to destroy the diversity of the territories it terrorizes, we will continue to work to help prevent mass atrocities, particularly against vulnerable religious and ethnic minorities.